Gini Wijnaldum has been a vital cog in Liverpool’s well-oiled machine this season, but neither he, his team-mates or Jurgen Klopp are content. In fact, they’re consistently striving for more. “He knows we can do better and wills us to do better,” the Dutch powerhouse told the official website. “It’s always good. If you’re happy with what we have right now, it will not make you better. He’s always like that. Some Liverpool fans raised eyebrows when we splashed out £23m on the relegated Newcastle midfielder in the summer, but like the vast of majority of Klopp’s signings so far, he’s settled in quickly. Deployed on the right of Klopp’s three-man midfield, Wijnaldum provides work-rate, tackles, interceptions and the important ability to retain possession in tight areas. By keeping the ball between himself, Jordan Henderson and Adam Lallana, the opposition is drawn into trying to win it back – which creates space for the front-three – usually Coutinho, Roberto Firmino and Sadio Mane. 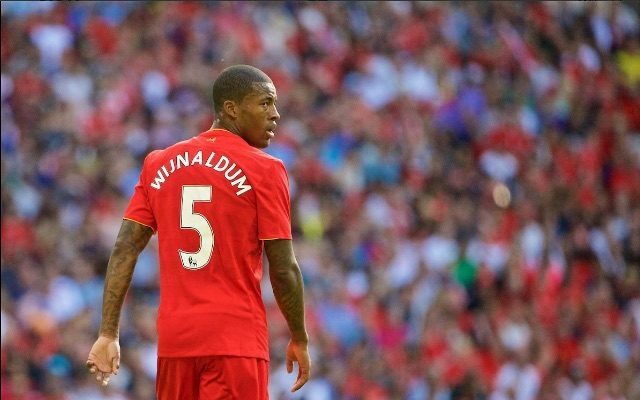 So far this campaign they’ve been devastating, but the biggest compliment you could pay Wijnaldum is that he’s currently keeping Emre Can out of the side. Last term, the German was arguably the first midfielder on the team-sheet. The 25-year-old has yet to score for Liverpool, but his overall contribution has been excellent. Hopefully, he continues to improve – just as he’s claimed he’s trying to.